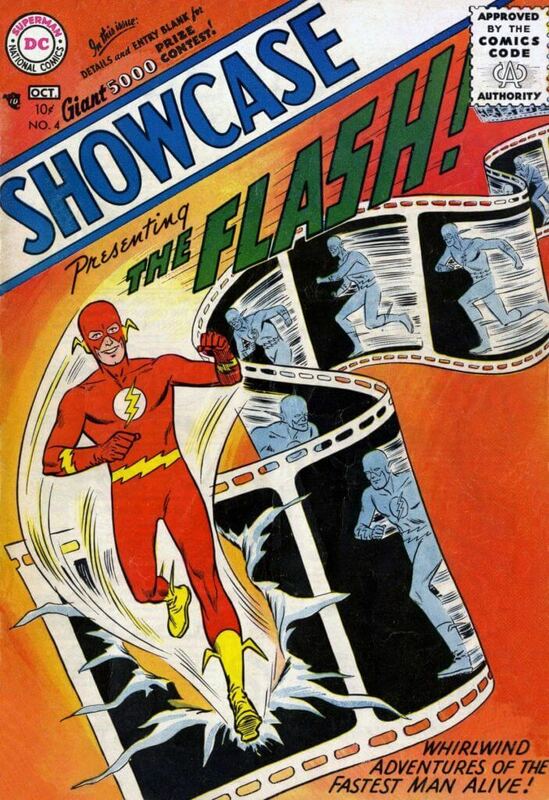 The Silver Age of DC comics kicked off with the introduction of Barry Allen in Showcase Vol. 1 #4, as did many subsequent eras in the publisher’s long and storied history. Barry Allen is a sign of change in comics, and it was through him that the DC Multiverse was first discovered in the now famous The Flash Vol. 1 #123 in 1961’s Flash of Two Worlds. Barry’s adventures are vast and span decades, so in the interest of time, we’ll go with a quick rundown of the iconic Scarlet Speedster in his pre-52 continuity followed by the current one. Barry Allen worked as a CSI in the Central City Police Department, having a strong sense of justice after watching his father be wrongfully accused of his mother’s murder. While working late in his lab (seems to be a pattern among superheroes) during a freak lightning storm, Barry was struck by a bolt of lightning that tore through the window to his lab – knocking him into a cabinet filled with now-electrified chemicals. Soon, the CSI realized that he had been gifted with superhuman speed! From the moment Barry first donned the now iconic Flash costume, readers knew they held something special in their hands. The Flash, under the watch of Barry Allen, gained a rogues’ gallery of villains that rivals that of even the Dark Knight himself. Mirror Master, Captain Cold, Golden Glider, Heat Wave, Weather Wizard and more, not to mention other singular foes in Gorilla Grodd and Reverse Flash, all gave the Flash a colorful collective of baddies that provided entertainment issue after issue. In fact, some of Barry’s rogues like Eobard Thawne (Reverse Flash), Gorilla Grodd, and Leonard Snart (Captain Cold), are considered among the best that DC has to offer. Barry Allen also has one of the greatest legacy success stories in his sidekick, Wally West, the first Kid Flash. Barry Allen’s exploits are the stuff of legends (at least in the pre-52 era), with one of his greatest moments taking place in the historic, year-long crossover event in 1985-1986, Crisis on Infinite Earths. This massive undertaking was to be a major reset for the DCU, and its purpose was to merge the expanse of the Multiverse into a single universe. 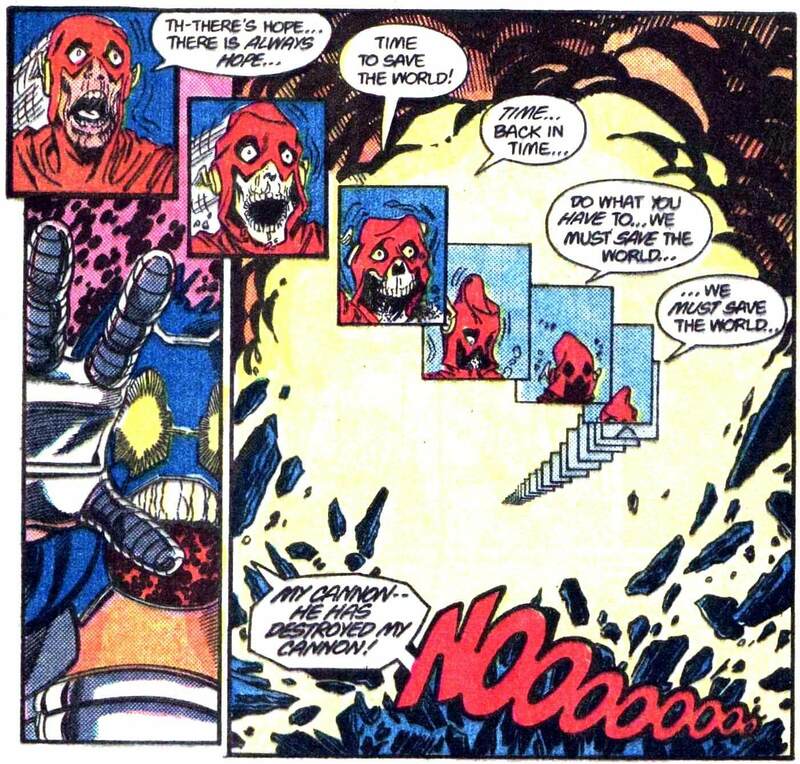 The Anti-Monitor threatens to annihilate the multiverse in its entirety, and the Flash (Barry Allen) sacrifices himself to destroy the Anti-Monitor’s antimatter cannon by quite literally running himself into oblivion. At this point, Barry is considered, by all fair rights, to be deceased indefinitely (although we comic book fans know better than to fall prey to such nonsense) along with hundreds of other heroes, including Supergirl (another hero who has had her fair share of returns). Twenty publication years after Barry’s heroic sacrifice, the 2005-2006 event Infinite Crisis confirmed what fans of the character had long suspected ever since the introduction of the Speed Force: Barry was alive; well, sort of. He had been trapped within the mystical energies of the omnipresent force created by Mark Waid during his mythos-expanding run on the Flash title, and he – along with Max Mercury and Johnny Quick (who were also stuck in the Speed Force) – helped Bart Allen trap the rampant Superboy-Prime in the Speed Force. Following that, and during the Final Crisis crossover in 2008, Jay Garrick and Wally West found Barry running from Death (Black Flash) in limbo, and he and Wally managed to outrun Darkseid’s Omega Beams in a return-to-sender moment that resulted in Death taking Darkseid’s spirit in place of Barry’s. Sometimes we get by with a little help from our friends. These events all converged and culminated in Flash: Rebirth, written by Geoff Johns and penciled by Ethan Van Sciver in 2009, wherein Barry was at last home again, and it’s in this story that he (and we) learned that the Speed Force is far more than some supernatural energy transcending space and time; Barry Allen himself actually created it, and with every step he runs, it expands. This knowledge is imparted upon Barry by Eobard Thawne, as well as the revelation that Thawne is the creator of his own “Negative” Speed Force whose energies run counter to those of the one created by Barry. Revelations are in no short supply in Rebirth, as the Reverse Flash also told Barry that he is singularly responsible for all of the tragedies in the Scarlet Speedster’s life, including the murder of his mother, Nora. 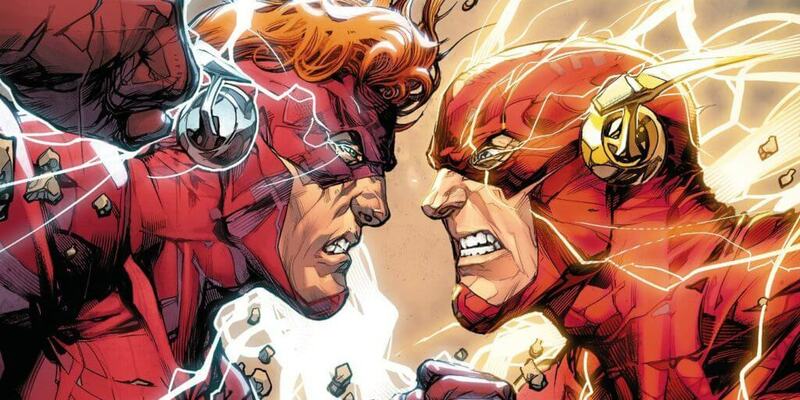 With Wally racing into the Speed Force to pull out his former mentor, the combined efforts of Barry and Wally, along with the Justice League, allowed them to trap Thawne and sever (for now) his connection to the Negative Speed Force, cutting him off from his powers. Fast Forward to “Flashpoint,” where Barry found himself powerless and in an alternate world of his own creation after attempting to prevent the murder of his mother. This Flashpoint world (not the one shown in half of an episode of the CW television show…) was a dark alternate reality in which Wonder Woman’s and Aquaman’s warring armies had all but destroyed the world in their attempt to defeat each other, and in place of Bruce Wayne, his Father Thomas became the Batman upon the murder of his son, while his mother Martha became that world’s Joker. Together, Thomas and Barry managed to restore his speedster powers and give him the chance to fix the timeline, but that didn’t quite work out as intended; the result was the New 52 relaunch of the DC universe and the subsequent present iteration of Rebirth continuity. The New 52 reset was intended as a way for DC to bring in younger readers via a complete start-from-scratch mentality with each hero and villain, and a visual update to modernize the characters’ looks for younger eyes to go alongside them. Barry Allen was no exception, as his Flash costume was given a refresh as well. And while its overall reception was mixed at best, one of the stronger runs in the continuity was The Flash comic books, with Barry Allen back as the titular hero. Barry’s run in the New 52 era brought with it some simplification of the character’s lore, while also introducing new properties to the Speed Force, and new heroes and villains to go along with him, such as the reboot era’s Wally West (a future Kid Flash whom we’ll cover in a later Flash Facts article), and his father Daniel West, who became the newest Reverse Flash. Flash fans had enough qualms with the New 52, but one of their larger issues was with Iris West. Iris and Barry and been long married in the pre-52 continuity and had a uniquely strong relationship. The reboot, however, threw that relationship in a grinder and that marriage was no longer part of their present standing. Upon DC realizing that a complete wiping of the slate was perhaps not what their fans had in mind, Rebirth and its subsequent continuity followed. The one-shot event involved the original Wally West going from person to person in a desperate attempt to find even one who would remember him. Each effort failed, even his pre-52 continuity wife, Linda Park, and he finally came upon the last person he could have the slightest hope to have remembered him: Barry Allen, the man who was his idol and had inadvertently gifted him his powers. When Wally’s hope was all but lost, Barry remembered his name, reached into the Speed Force and dragged his former sidekick out from being lost to the endless void of time. After learning all he could from Wally about the Flashpoint timeline and the fact that ten years had been stolen from everyone’s memories, Barry sought out Bruce in the hopes of putting their scientific minds together and unraveling this new mystery. Following Bruce being beaten half to death by Reverse Flash, the two Justice League members traveled together, via Cosmic Treadmill, to the Flashpoint world (which is supposed to have been fixed) where Bruce met his father as the Batman of that timeline. The journey resulted only in more questions as whatever had been holding the Flashpoint together loosened its grip, and it began to fall apart all around them. Barry and Bruce rushed back into the timestream and came upon Thawne, who claimed to know who was truly behind the Flashpoint’s creation, as well as the altering of the world’s memories, and he was determined to confront him. This desire doesn’t end well for the Reverse Flash, and he was quickly vaporized by the unseen power, which then threatened to erase Flash and Batman from existence as well. 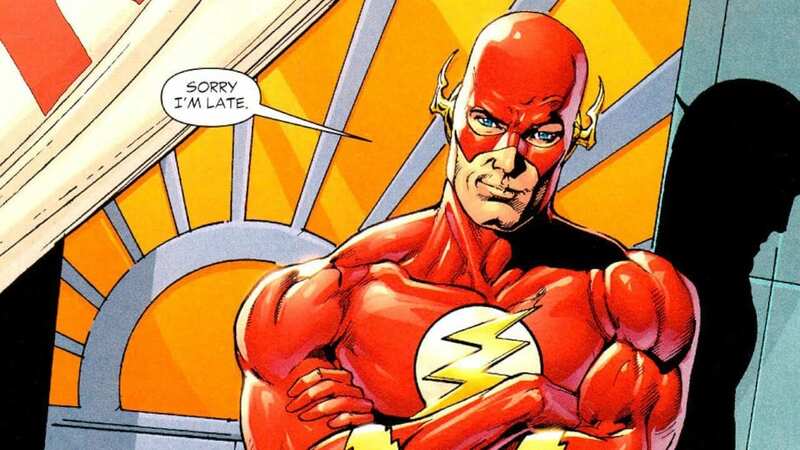 As the Cosmic Treadmill was shattered, Barry heard a calming voice calling out to him, imploring him to remember him and say his name, “Jay.” As Barry hesitantly repeated the name, Jay Garrick, the original Flash, burst through the Speed Force and pushes Barry and Bruce through the timestream and back to their proper time and place. Jay tried to get Barry to remember him as he did Wally so that he too may be freed, but Barry was unable to recall Jay of his own volition and was pulled back into the timestream while the heroes were left to continue their search for answers. Barry also helped to train Iris’ nephew, Wally (the New 52 one, which we’ll refer to as “Wallace” from here on out to avoid confusion), as the next Kid Flash, and Wallace helped Barry take down the Speed-Force-stealing villain Godspeed who turned out to be Barry’s own best friend and associate at the Central City Police Department, August Heart. In the aftermath of the Godspeed arc, Meena Dhawan, with whom Barry had been becoming close as they researched the recent Speed Force storm, disappeared. Some months later, Iris was kidnapped by Thawne (the guy has a great immune system against death), who, after Barry tracked him down, beat the Flash to a pulp and then unmasked him to Iris. He then took them to the future and showed them their future children. This shocking revelation, along with Thawne threatening Iris’ and Barry’s lives, caused Barry to lose control and attack the Reverse Flash with uncharacteristic brutality, becoming infected with Thawne’s Negative Speed Force. Iris fired a Black Hole weapon at Thawne and seemingly killed him before demanding that Barry take her home. When Barry and Wallace ran into Meena again, she feigned a desire to help Barry get a handle on the Negative Speed Force, which had turned his powers destructive and dangerous for everyone in his path, it was revealed that instead she was working with the evil Black Hole organization and attempting to harness the power of the Speed Force. Following the events of the Source Wall-breaking Dark Knights Metal event, Barry discovered that the Rogues led by Leonard Snart – who had been locked up in Iron Heights – had been running an operation beneath the maximum security prison compound. In a face-turn, August Heart, Godspeed, helped Barry to bring them all back under control and told his former CSI partner that he wished to atone for his sins. August got his chance not long after when Gorilla Grodd returned to Central City with the mission of controlling the Speed Force. After getting his powers stolen from him, Barry broke August out of Iron Heights and requested his aid. August reluctantly agreed and they, along with Wally West, Wallace, and Avery the Kid Flash of China, attempted to take back Barry’s powers and de-power the gorilla. The battle was a trap, and Barry witnessed his teammates coming under the mind control powers of Grodd and ran from them before freeing them from the monkey’s mind manipulation and defeating him after he unleashed the Negative Speed Force upon the city. All of the Flashes helped to rebuild Central City following the Perfect Storm arc, and Barry tried to push Wally to reveal himself to his aunt, Iris, but the Flash was still too worried that she wouldn’t be able to handle the revelation that she’d forgotten the nephew she’d raised more than his own parents. Eventually, a meeting was set up between them, and upon their reconnecting not only did Iris remember Wally, but the remaining missing memories from his time before the Flashpoint suddenly came flooding back. The reunion was short-lived, however, as a police force from the 25th century called the Renegades was sent through time to arrest and bring Iris West to trial for the murder of Eobard Thawne. After a heated disagreement on their level of compliance, Barry, Wally, and Wallace all went with them to stand with Iris and defend her innocence if necessary. When the rest of the group arrived in the proper place, Wally West was nowhere to be seen. Barry tracked him down and learned that Wally had been told how he might find his children who have been lost in the Speed Force. The problem, however, was that the source of that information was Hunter Zolomon (a.k.a. Zoom) and Barry was skeptical of his word, to say the least. But Wally wouldn’t be dissuaded and was determined to locate his missing children by breaking the Speed Force itself, and he and Barry shared strong words before Wally bolted off, and Barry attempted to chase after his protégé beginning the Flash War event. Barry, being far more than merely a Speed Force Conduit as he is the actual creator of the Speed Force itself, logically possesses all of the general abilities gifted to those who tap into its energies. Every step that he runs expands the reach of the Speed Force further through time and space, transcending such barriers; this allows for speedsters who pre-date Barry by hundreds of years, such as Max Mercury, to have harnessed its power. But far more than that, he also has the ability of DIMENSIONAL TRAVEL by using the Cosmic Treadmill to create wormholes and travel to any point in time, sometimes to the detriment of the universe, as shown in “Flashpoint.” Being the creator of the Speed Force also makes Barry uniquely immune to the speed-stealing or negating properties of other speedsters who tap into it; this does not, however, apply to Eobard Thawne’s Negative Speed Force powers. ELECTROKINESIS is among Barry’s powers, his energies manifesting as yellow lightning which he can use to a variety of effects, such as channeling them for discharging lightning bolts from his hands or storing his suit within his ring. While not necessarily a power per se, he also has an immense amount of HOPE within him and can utilize a Blue Lantern’s Corps power ring, as shown in the Blackest Night event. 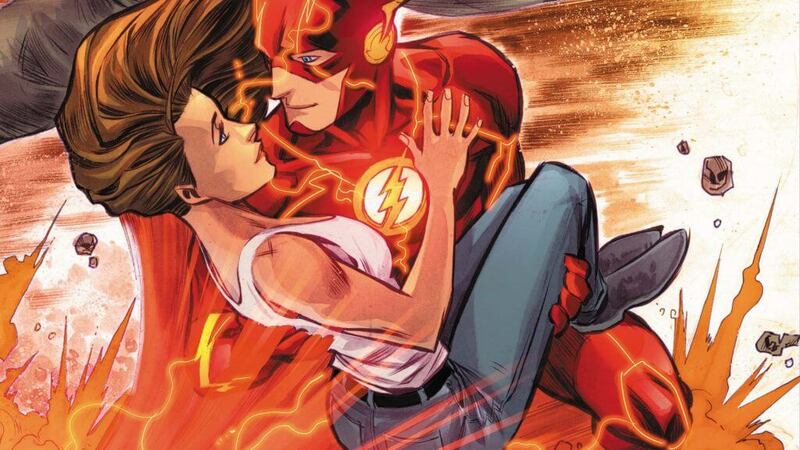 Barry Allen is considered by many fans to be the “one true Flash,” and for good reason. It’s no matter of happenstance that Barry is the primary Flash of the CW Arrowverse television series; the character is undeniably likable, and his strong sense of right and wrong is perfect for bringing in new fans to the franchise. Barry is quite literally the perfect starting block for someone looking to get on the right track and begin a gauntlet run of the Flash superhero comics. His current iteration in DC Rebirth is as classic as it gets for the character: hometown heroics with a dusting of time-hopping antics (just no more Flashpoints, please).